Home Blog New Bel Air Financial Center is Now Open! 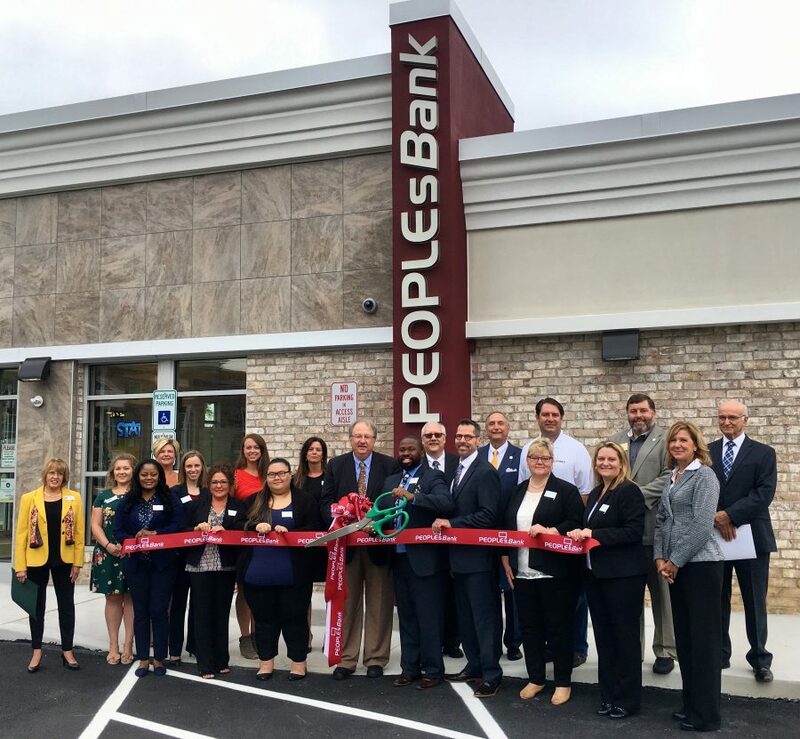 PeoplesBank, A Codorus Valley Company, has officially opened its newest financial center, located at 140 North Main Street in Bel Air, Maryland. This new location includes ATM service, free shredding, touch screen technologies, and a fresh interior and exterior design. Bank officials, along with local dignitaries and elected officials, marked the occasion with a ribbon cutting ceremony on Friday, September 21, 2018. Shown in the picture cutting the ribbon, from left to right are: Susan Burdette; Mayor of Bel Air, Heather Irizarry; Harford County Chamber of Commerce; Tawana Williams; PeoplesBank, Christine McPherson; Bel Air Downtown Alliance, Amy Doll; PeoplesBank, Anna Mauldin; PeoplesBank, Jenny Falcona; Bel Air Downtown Alliance, Megan Chan; PeoplesBank, Amy Chmielewski; Bel Air Town Commissioner; Larry Miller; PeoplesBank, Rod Davis; PeoplesBank, Todd Tyson; PeoplesBank, Chad Clabaugh; PeoplesBank, Robert Andrews; Harford County Economic Development, Donna Wertsch; PeoplesBank, Chad Shrodes; Harford County Councilman, Dee Braun; PeoplesBank, Len Parrish; Harford County Community and Economic Development, Janet Noone; PeoplesBank, Jesse Bane; Bel Air Town Administrator. “We are excited to continue to serve the residents and businesses of Bel Air at our brand new Financial Center that offers more convenient services to our clients,” commented Craig L. Kauffman, President and CEO. With assets in excess of $1.8 billion, PeoplesBank, A Codorus Valley Company, is a wholly-owned subsidiary of Codorus Valley Bancorp, Inc., the largest independent financial institution headquartered in York County, Pennsylvania. PeoplesBank offers a full range of consumer, business, wealth management, and mortgage services at financial centers located in communities throughout South Central Pennsylvania and Central Maryland.